MISS MAY I have debuted the first track and official music video for “Lost In The Grey”, which comes off their new album, Shadows Inside (SharpTone Records), due out on June 2nd. 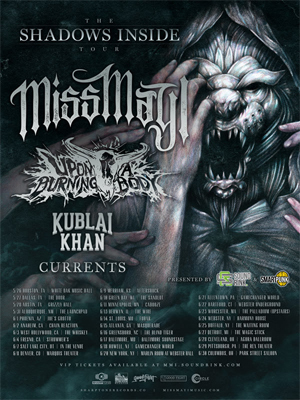 Don’t miss out on catching MISS MAY I on their headlining North American tour starting in Canada on May 11th. Either see below and head over to https://www.facebook.com/missmayi for all tourdates and special VIP “Meet and Greet” ticketing info. Shadows Inside was co-produced by Drew Fulk (MOTIONLESS IN WHITE, EMMURE, CROWN THE EMPIRE) and Nick Sampson (ASKING ALEXANDRIA, BORN OF OSIRIS). Andrew Wade (A DAY TO REMEMBER, THE WORD ALIVE, NECK DEEP) handled all mixing duties. Watch the “Lost In The Grey” Official Music Video – Directed By Ramon Boutviseth (ASKING ALEXANDRIA, VEIL OF MAYA) - on KNAC.COM right HERE. Levi Benton (vocals) states: "Our new video for "Lost In The Grey" was by far the most extreme video we have ever done! The shoot involved an entire forest landscape set, live action volatile weather elements and rodents in mouths. We have never had a video like this before. The vibe for the song is really captured well and sets a great image not only for the song, but the record as a whole. Shadows Inside is the most honest record we have ever created and a big part of that was just having the freedom and time to put everything we had into it. The sound and fury of MISS MAY I is deeply embedded in the hearts and minds of a legion of fans. The band’s brand new album, Shadows Inside, doubles as monster riff-fest and forcefully vocal driven statement shaped by changes both within and without. Make no mistake, this isn’t an about-face album full of contrived sentiment or glossy emptiness. It’s a record where the band challenged each other to work from outside of their comfort zone, to really hone in on what makes MISS MAY I vital, and deliver something fully authentic and raw. The five-piece powerhouse, from the fertile metalcore grounds of America’s heartland, have become an integral part of the worldwide heavy music community, transcending boundaries and limitations, galvanizing crowds, and energizing each person they encounter.